The Girton Capital Growth Letter is a quarterly publication providing you with our latest economic and market analysis and portfolio company updates. A sample Girton Capital Growth Letter ("Investing in Growth Stocks You Can Believe In"), the March 2012 edition, is available at the bottom of this page. Please contact us via email for subscription and sample log-in information. "A Sea Change in Telecom and Media Companies"
There is a sea change occurring in media/ telecom companies. Due largely to Netflix’s success in content delivery and subsequent content creation, media companies are repositioning to take advantage of high-speed telecom delivery paired with their own media creations. Recently, Disney completed a $71 billion acquisition of 21st Century Fox entertainment assets and is planning its own content delivery service. Apple is rolling out its new streaming video/news/music service, and HBO/Time Warner also plans to do so. Meanwhile, telecom companies have added content to complement their delivery capability. Verizon now owns AOL and Yahoo, and AT&T recently bought Time Warner, Inc. Social media companies are getting in on the action as Facebook owns the messaging company WhatsApp, Alphabet owns YouTube, and Amazon Prime has added streaming video. The big changes in media/telecom explain why the S&P500 recently combined two of its industry sectors, adding telecom stocks Verizon, AT&T and Comcast to media companies Netflix, Disney, Alphabet and Facebook to form the S&P 500 Communications Services Sector. Read the January 2019 Girton Capital Growth Letter: "A Sea Change in Telecom and Media Companies" ...) to see a pie chart showing the company allocations in this new sector. "Investing in Big Data Software Companies"
In the 2017 book, Everybody Lies: Big Data, New Data, and What the Internet Can Tell Us about Who We Really Are, Seth Stevens-Davidowitz captures big amounts of data from people’s Google searches, providing deeper information about their lives and inclinations. For example Google local searches for flu symptoms or muscle aches have proven to be important indicators of how fast the flu is spreading in different parts of the country. Likewise, in his book Factfulness, Hans Rosling uses big data to show that, contrary to popular opinion, many things are getting better on planet Earth, including child survival rates in many poorer countries. Much of big data now resides on the “cloud,” which is defined as “shared pools of computer system resources and services that can be rapidly provisioned, often over the Internet.” Big cloud service providers include AWS (Amazon Web Services), Microsoft Azure, Google Cloud Platform, The IBM Cloud, and others. According to IBM, with public cloud services, users don’t need to purchase hardware, software, or supporting infrastructure, which is owned and managed by the cloud providers. "Investing in Natural Beauty Products"
The beauty industry is one of the oldest businesses in the world, dating back 7,000 years to the early Egyptians and Greeks. Today, the beauty industry is divided into cosmetics and skin care, hair care, and fragrances. The $62.5 billion US beauty market is split into premium and mass market lines, with luxury dominated by L’Oréal and Estée Lauder. According to the chart below, cosmetics sales tend to grow fairly steadily, and are considered a defensive investment, as cosmetics stocks tend to perform better in recessions than typical growth stocks. Beauty product distribution ranges from kiosks at department stores such as Nordstrom or Macy’s, to standalone beauty salons, such as Bluemercury, Sephora, Sally Beauty and Ulta Beauty. Network marketing companies such as Avon Products, Mary Kay Cosmetics and NuSkin Enterprises play an important role as do online companies, including Amazon. "Organic & Natural Foods Are Going Mainstream"
In the just-published book Hippie Food, author Jonathan Kauffman explores the long and flavorful history of organic and natural foods from Los Angeles’ Aware Inn and Health Nut restaurants in the 1950s, to today’s Whole Foods and Hain Celestial. Hain is one of the major purveyors of hippie food today with its Celestial Seasonings tea, Imagine soup, and Garden of Eatin’ organic corn chips. Hippie Food presents many of the diet crazes of the hippies, including brown rice, tofu and tempeh, brown bread exemplified by the classic Tassajara Bread Book, and vegetarian food, highlighted in the Moosewood Cookbook. These trends have evolved into today’s fresh, organic and local food movements. In 2017, the Organic Trade Association marked the 20th year of its survey and over that time sales of organic foods have multiplied by 15 times, starting from $3.4 billion. As you can see in the chart to the right, organic food sales in the US grew 6.4% to a record of $45 billion in 2017. At 5.5% of total food sales, organic foods are certainly in the mainstream, and organic food growth continues to far outpace overall food growth, which was up only 1.1% last year. "Investing in Coffee, Tea or Chocolate?" A few years ago, we invested in Peet's Coffee stock, which was taken over in 2012 for nearly $1 billion, or $73.50 per share, by Joh. A. Benckiser (JAB Holding Company - private) of Germany. JAB went on to take over Keurig/Green Mountain Coffee, which earlier had acquired a number of smaller roasters, such as Dietrich's Coffee. Today, that leaves Starbucks as the only major US public coffee company to invest in. From an investment perspective, coffee, tea, and chocolate have a couple of things in common: they have high profit margins, and people enjoy them daily — sometimes several times per day. This combination makes them a great source of cash flow and business growth. Particularly profitable are high-end products, such as Kona coffee, organic dark chocolate, and estate grown Darjeeling tea. In addition, recent stories have extolled the heart and health benefits of dark chocolate, as well as drinking coffee (in moderation). "Retail's Dynamic Shift from Shopping Malls to E-Commerce"
There is a sea change happening in consumer spending that affects how we invest in retail and other stocks. 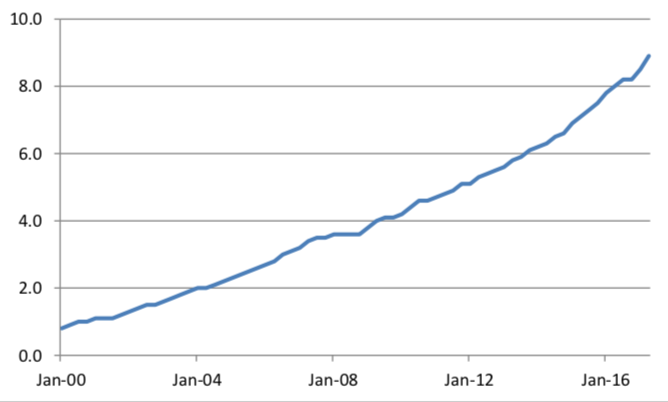 First, there is a long term shift from shopping at malls to online e-commerce (see graph). Second, the hurricanes that affected Houston, Texas and southern Florida will have a short term negative effect on retail sales. Third, even before the hurricanes, there was a slight weakening of retail sales growth in recent months. However, retail sales could improve in the future, particularly if there is higher employment, wage growth or even better, a tax cut for the middle class. The retail sector is under siege right now, with many announcements of weaker same store sales trends, fattening revenues, and lower profitability. This is largely due to the shift from brick and mortar store shopping to on-line shopping, with quick shipments directly to your home. To date, e-commerce has largely been composed of the electronics, home & kitchen, and clothing and shoe businesses, but with Amazon's recent purchase of Whole Foods, it is likely to increasingly affect groceries, including fresh fruits and vegetables. "Surveying the IPO and Spin-off Markets for New Ideas"
A good source of new investment ideas are IPOs (initial public offerings) and spin-offs (companies distributed from larger companies). One way to find recent IPOs and spinoffs is by using software to screen the market for stocks that didn't exist one or two years ago. Another way is to read the IPOScoop or RenaissanceCapital IPO websites and discover new IPOs there. Using these techniques, we surveyed over 100 recent IPO and spin-off companies, searching for new ideas that meet our sustainable and financial investing criteria. In reviewing IPO and spin-off companies, we are looking for a unique company that has an attractive business model. We also like companies with high glassdoor.com scores — that means they are good to their employees. When we looked at recent IPOs, we tried to find profitable companies that had something unusual to offer, as opposed to companies with commodity-like products. Companies that own unique market niches do not have as much competition as those in hot market sectors. "The Growing Market for Probiotics and Fiber to Help Your Microbiota"
In the past few years, a remarkable number of books have been written about the microorganisms, also known as your microbiota, living and feeding in the human gut. A sampling of book titles range from 10% Human (meaning only about 10% of your cells are truly your own and not bacteria living on or in you), I Contain Multitudes (same idea), Grain Brain, The Good Gut and many more. Along with these books, a panoply of new cookbooks will not only help you feed yourself properly, but also will feed the little friends in your gut. Because if the beneficial bacteria in your gut are happy, that helps make you happy too. According to the book, The Good Gut, by Justin and Erica Sonnenburg, your microbiota is composed of 1200 to 1600 species of microorganisms or bacteria. Sometimes called another human organ, your microbiota contains upwards of 2 million genes (called the microbiome), which is 100 times more than the 20,000 genes in the human genome. Beneficial bacteria can protect your gut, and can digest plant material not normally digestible by humans. Your microbiota is also thought to send cues to your immune system when things get out of balance. There are two key ingredients for ..
"Precision Oncology: A New Way to Diagnose and Treat Cancer"
The Human Genome Project culminated on April 14, 2003, with the sequencing of a reference copy of the entire human genome. When the sequencing of the approximately 20,000 human coding genes was complete, human genome scientists moved on to new goals, such as the sequencing of individual genomes with all their traits and mutations. Human genome sequencing led to personal genetic tests like 23andMe's. These provide information about your health and heritage including traits such as hair and eye color, and where your ancestors are from. There are even stories of people finding long lost relatives using the service! While it took over ten years to sequence the initial reference human genome, in 2015, Edico Genome, using its Dragen processors and "next generation gene sequencing," lowered the time to sequence an individual's genome to just 26 hours. Similarly, the cost of sequencing one human genome (at least the active protein-coding regions, or the "exome") has fallen dramatically to under $1,000, and it continues to drop. These trends will soon provide genomic sequencing of the DNA of a person's cells, one cell at a time, in order to help diagnose cancer and other diseases. This detailed access to genetic information has ushered in a new era of personalized medicine. "What Stock Market Humor Can Teach Us About Investing"
Buy low, sell high! Buy high, sell higher! The market is like a roller coaster! These are some of the stock market aphorisms that have been quoted over the ages to ease heart palpitations as the market gyrates wildly from day to day, or perhaps, to ease boredom on those days when nothing is happening. There are times in the market, such as a recent day when the Dow Jones was down 400 points, when humor is needed to stay on an even keel, and to remember not to "plan according to your hopes and act according to your fears." On weak market days, as market technician Dale Ames says, "we have the breakfast cereal stocks: They go snap, crackle, and DROP!" whereas on strong market days, people sit back, and enjoy their genius as they bask in the profits. But wait, didn't the pundit say "Never confuse genius with a bull market?" When stocks are up, it's easy to think you are brilliant, but humility returns with the next market correction. "The Global Water Infrastructure Needs More Investment! " Matt Damon, the star of the movie Good Will Hunting, which was set in Boston close to MIT, spoke at the 2016 MIT commencement ceremonies, discussing how students can help solve the world’s problems. One of the problems he introduced was how to get fresh water to people in poverty-stricken areas such as Africa and India, and he referred the students to the website www.water.org. This charitable organization offers micro-loans to poor people so that they can get access to fresh water, and also to install sanitary toilets. Closer to home, the cash-strapped city of Flint, Michigan recently suffered a major setback when they, with the approval of State of Michigan, decided to switch their water supply from Lake Huron to the Flint River. The Flint River is polluted, so after the switch, the city’s public drinking water tasted foul and the corrosive water increased lead levels as well. Children who drank the water had higher levels of lead in their blood, which causes intellectual impairment. It took a local doctor to sound the alarm, which, after denials, eventually led to the reinstatement of the good water. The Flint water system is just one of many outdated water systems in the United States, which on average, need to be repaired or replaced every 50 to 100 years. The market for water services is divided into public water utilities and private water utilities. The difference is that one is owned by municipalities and the other by public companies, but both need access to capital from the public markets. "The Best Companies to Work For and to Invest In!" In March 2008, we discovered in our report The New Nifty Fifty: The Best Places to Work Worldwide, that companies that are better to work for also performed better in the stock market. This link between job satisfaction and company stock value is probably due to higher employee motivation, lower turnover and better productivity. In his recent TED Talk, The Social Responsibility of Business, Alex Edmans, professor at the London Business School, says that "caring about society is not at the expense of profit – it supports it." In his 2012 study, The Link Between Job Satisfaction and Firm Value, With Implications for Corporate Social Responsibility, he shows that the Fortune 100 Best Companies to Work For stocks outperformed their peers by 2-3% annually over a 26 year period (see http://alexedmans.com/research/). 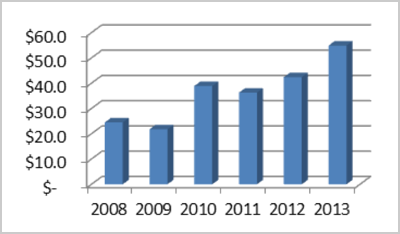 "Benefitting from the Record Mergers & Acquisitions Trend"
Global mergers and acquisitions (M&A) in 2015 are on track to exceed the $4.6 trillion record set in 2007 (see chart below), with the US now at over $2.0 trillion, according to Dealogic.com. Recently announced mega-mergers include Pfizer buying Allergan for $160 billion, Anheuser Busch buying SABMiller for $106 billion, and DuPont merging with Dow Chemical. Below these mega-mergers are smaller mergers in the so-called “middle market.” For example, JAB, which bought Peet’s Coffee a few years ago, is now buying Keurig Green Mountain for $13.9 billion, a 78% premium to its pre-deal value, and over 3 times its annual sales. Our portfolios have benefitted this year from several acquisitions as Kraft merged with Heinz, Cellular Dynamics was bought by Fuji Film for $16.50 per share in cash, and Diamond Foods announced that it is being bought by Snyder’s-Lance. As growth investors, we focus foremost on the growth of the company; however, we think it’s instructive and helpful to imagine that the company might be acquired, and who the logical buyers might be. "Cutting Carbon through Solar Power & Battery Storage"
According to the Solar Energy Industry Association, the US installed 1.4 gigawatts (GW) of solar electricity generation in the 2015 second quarter to drive the industry to over 20 GW of total photovoltaic capacity. This year 90% of all new electric generation in the United States came from renewable resources such as solar and wind power, while coal plants have declined in production. However, since the sun is not always shining, or the wind blowing, most of the nation’s electrical power is provided by coal and natural gas plants, which poured 2 billion metric tons of polluting carbon into our atmosphere in 2014. Riding to the rescue, Tesla Motors chief Elon Musk said in his most recent conference call that if utility scale battery storage systems become ubiquitous, one/half of all carbon-based utility power plants could be shut down. "Investing in 'Clean, Fresh and Organic' Foods"
Americans are, perhaps surprisingly, continuing on their healthy eating and lifestyle trend. According to the US Department of Agriculture, "American adults are eating better, making better use of available nutrition information, and consuming fewer calories coming from fat and saturated fat, consuming less cholesterol and eating more fiber." More people are buying clean, fresh and organic foods at Whole Foods Market and visiting restaurants such as Chipotle Mexican Grill and Zoe's Kitchen, which provide fresh and natural ingredients in their menus. Even old line, Big Food companies are getting into the organic/fresh food act. According to a recent Fortune article, "major packaged-food companies lost $4 billion in market share alone last year, as shoppers swerved to fresh and organic alternatives." Kraft Foods and Yum Brand companies Taco Bell and Pizza Hut (as well as Panera Bread) recently decided to eliminate additives and preservatives from their foods in the new "fresh food" trend. Many food companies have engaged "the Non-GMO Project" (see box below) to label their foods as GMO-free or containing no "genetically modified organisms." The internet ecosystem continues to evolve, changing the face of media, advertising and commerce throughout the world. A surge in US venture capital investment -- $33 billion raised in 2014 -- has created new private internet-enabled companies, such as taxicab replacements Uber and Lyft, real estate rental firm Airbnb, collector's website Pinterest, storage site Dropbox, and many more that are challenging or surpassing the established players. However, these established internet giants (see chart below) sometimes "get even" by purchasing the young upstarts. For example, Facebook bought messaging firm WhatsApp last year for $19 billion and OpenTable, a restaurant reservation company, was bought by Priceline for $2.6 billion. Select internet giants, ranked by stock market capitalization. New companies and business models have appeared that were unimaginable just a couple of decades ago. Take Yelp for example, a "free speech" app that allows public reviews of local restaurants and other establishments. You can visit a restaurant, order your food, and write a restaurant review on your mobile phone and rate your experience on a five star system. It turns out that any restaurant that is rated over 4 stars is awfully good (if the reviews are not rigged, that is!). Angie's List provides a similar service for local home service businesses like plumbers, furnace repair, and building contractors. Growth Stocks You Can Believe In: The Innovators! In our March 2012 letter, "Growth Stocks You Can Believe In!" we pointed out that finding excellent products or services is a good way to find investment ideas. These ideas come from sustainable industries that we closely follow, such as community banks, social networking, the Best Companies to Work For, women-led companies, positive medical products, cleaner air and water, and organic and natural foods, among others. The legendary investor Peter Lynch says to, "invest in what you know," and we might add, "invest in what you believe in." We see innovation implemented by an excellent management team as the key to searching for exceptional stocks that Peter Lynch called "10 baggers," or companies that might provide a ten-fold return on investment over time. Innovation is important because it boosts productivity and often provides delightful new products or services for consumers. Product innovation is easily demonstrated in new products such as Apple's iPhones, Tesla's electric vehicles, and Nextera's solar and wind power systems. A recent Bloomberg article called Paper Clip-Sized Heart Devices Open New Industry Markets reports that a tiny device called the Reveal Linq, made by Medtronic, can be inserted under the skin of the chest to report heart abnormalities that might occur only twice a year. Medtronic and St. Jude Medical are also making tiny pacemakers that can be threaded into the heart via an artery and have the battery power to operate there for a decade. Advances like these in medical technology, which some might call miraculous, are creating new solutions for heart health, new robotic surgical techniques for the knee, hip and spine, and many other healthful cures for the body. These new products are helping many leading medical technology companies to grow revenues in the mid-single digits, and at much higher rates for newer products. An Ernst & Young report indicates that the US medical technology industry had revenues of $210 billion in 2012, led by companies such as Johnson & Johnson, Medtronic, St. Jude Medical and Stryker. Recent press reports on the melting West Antarctic ice sheet confirm that climate change and global warming are serious problems. Carbon dioxide atmospheric levels have increased to over 400 parts per million, up over 24% since 1958, which could eventually lead to a large rise in sea levels. President Obama and the EPA have responded to climate change with a plan to reduce US carbon emissions by 30% by the year 2030, largely by reducing emissions from the 600 coal plants in the US, which produce about 40 percent of US electricity. The West Coast has been a leader in regulating carbon emissions, with California requiring that 33% of its electricity be generated from renewable energy by the year 2020, a good ten years ahead of country as a whole. Pacific Gas & Electric (PG&E) says that they have already exceeded a target of 20% renewables. Unlike the Midwest and East Coast power utilities, where coal often amounts to 40% to 70% of electricity generation, coal plays a minor role in west coast power generation. In addition, California utilities such as PG&E and Edison International have pledged not to build additional nuclear plants as they focus more on renewable energy sources. When we first wrote on initial public offerings or "IPOs" in June 2010, there was a scarcity of new companies going public following the financial crisis of 2008-09. This led us to suspect that those few companies that managed to go public could be investment gems, and in retrospect, that seems to have been true. Looking back at our 2010 IPO list, a number of stocks rallied smartly and some, such as Ancestry.com, were taken over. Since then, many more companies have gone public, particularly in 2013 (see graph). Our earlier letter covered the basics of IPOs, so we will focus this letter on new ideas generated from IPOs over the last twelve months. US Solar Power Boom Helps Light up the Grid! The combination of reduced solar panel costs per watt, higher electricity prices and programs such as California’s Solar Initiative, has spurred the rapid growth of utility and residential solar installations (see chart below). According to the Solar Energy Industries Association (SEIA), the US installed 930 megawatts of photovoltaic solar power in the third quarter of 2013, up 35% from last year. Total US installations have surpassed 10 gigawatts cumulatively with over 400,000 individual solar projects now operating. Solar and wind energy have become a leading source of new electricity generation in the US today. The shrinking personal computer industry is being supplanted by new mobile devices, including cellular smart phones, iPads and other tablets, and ultra-light computer notebooks. However, even growth in cell phones and tablets has started to slow as we enter the fifth generation of Apple iPhones, the Apple 5s and 5c models, and fourth generation Samsung Galaxy 4 Smartphone. So the technology market is preparing to introduce the next big thing: wearable computer devices! Today there are several types of wearable computing devices: smart watches, fitness monitors, and computer eyewear such as Google Glass, currently in beta testing. "Smart watches" have been in the marketplace for some time—Microsoft even launched a smart watch in 2004! In addition to telling time, they attach or "pair" to smartphones, quietly relaying information from the phone to the user regarding texts or phone calls. The latest smart watches include the $150 Sony Smartwatch, $300 Qualcomm Toq, and $299 Samsung Galaxy Gear, which features the largest, most vibrant smart watch screen, but needs to be charged daily. Apple is thought to be working hard on its iWatch, but has been secretive as to when it might be launched. Wearable fitness and health monitors such as the Nike Fuelband or the Fitbit are devices used for fitness and health to measure how far you've walked or run and how many calories you may have used. The Nike Fuelband is a waterproof wristband that measures and reports your daily physical activity and reports it to your phone. San Francisco based Fitbit makes a device that tracks both physical activity and your sleep habits. The company claims that its users take 43% more steps with Fitbit. The Fitbit also tracks the quality of your sleep at night and can wake you in the morning. Whole Foods Market Inc., purveyor of organic and natural foods, recently announced that by 2018 all products sold in its U.S. and Canadian stores must be labeled as to whether they contain genetically modified organisms (GMOs). The company, which already sells about 3,500 non-GMO items, supported California's failed Proposition 37 last year, which would have mandated genetically engineered food labeling. Whole Foods CEO Walter Robb said, "We're responding to our customers who consistently asked us for GMO labeling. We are stepping up our support of certified organic agriculture, where GMOs are not allowed." Now that President Obama has been reelected, it appears as though Obamacare, or The Affordable Care Act, is the law of the land for at least the next four years. Most analysts agree that there will be 25 to 30 million new patients receiving healthcare coverage over the next few years. This additional demand may lead to an increase in the square footage required for hospitals, medical office buildings, senior living centers and skilled nursing facilities. Obamacare is also expected to reduce healthcare spending over the same timeframe mostly through cuts in Medicare reimbursement. However, one area that seems largely immune to cuts in Medicare is private-paying senior living communities. 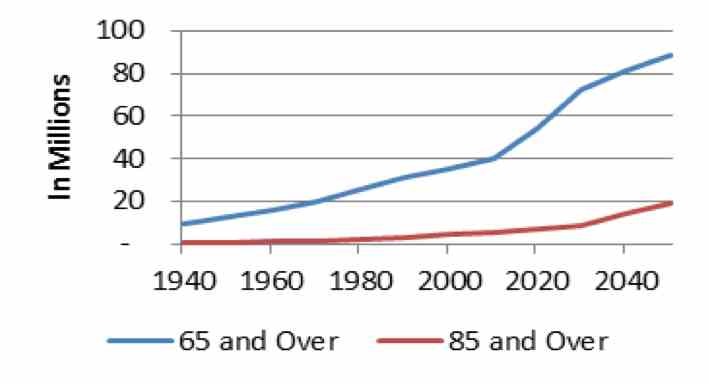 The demographics over the next decade or two clearly favor senior living communities. The first baby boomers were born around 1946, or 66 years ago, so the aging of America is in full swing. 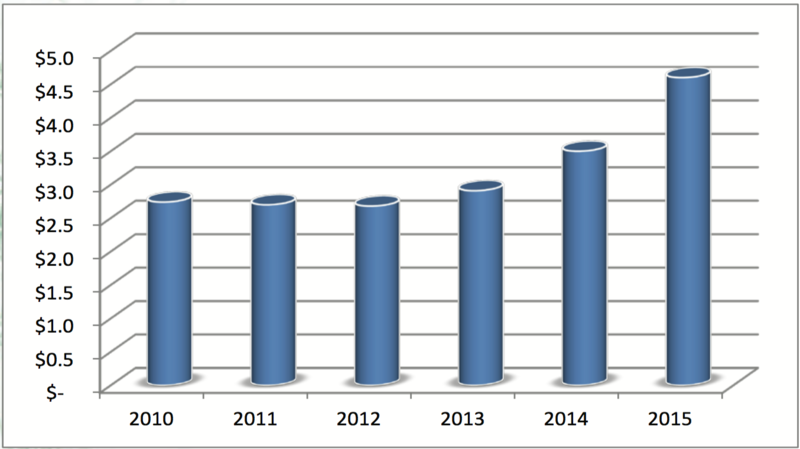 As you can see from the graph, the over 85 group is projected to grow from 5.5 million in 2010 to 14.5 million in 2040, while the over 65 group doubles from 40.3 to 81.2 million. As we all know, the Midwest has suffered a severe drought this year, with a major loss in the corn crop, resulting in corn prices surging to recent highs (see graph). Also this year, big Hurricane Isaac hit New Orleans with record rainfall and flooding. Persistent changes in global weather patterns, such as major droughts and hurricanes caused by global warming and other factors, will require new and enhanced water strategies for the world. New technologies discussed in this report, such as desalinization, dewatering, and efficient irrigation promise to provide a sustainable growth opportunity for investors in the years ahead. According to a presentation from Xylem Corporation, a leading water equipment manufacturer, the global water industry is a $500 billion business consisting of water infrastructure, which includes water transportation and treatment, and applied water, which includes irrigation, and industrial and building usage. A subset of the global water industry is equipment and services, a $280 billion market, consisting of pipes, valves and pumps, as well as high-technology areas such as energy efficient pumps and water analytics. The most vibrant and fastest growing area of the internet today is the social networking field including Facebook and LinkedIn. These massively linked social networks allow communication between millions (or billions!) of people daily as well as the sharing of news, sports, business and entertainment information between their users. Social networks have been so successful that they are emerging in business enterprises such as Salesforce.com's Chatter application, and a service called Yammer, which was recently purchased by Microsoft for $1.2 billion. The leader in social media is Facebook (FB), with over 900 million active users (see map to right [in report]), followed by LinkedIn (LNKD) with over 150 million users, and Twitter with over 100 million users. 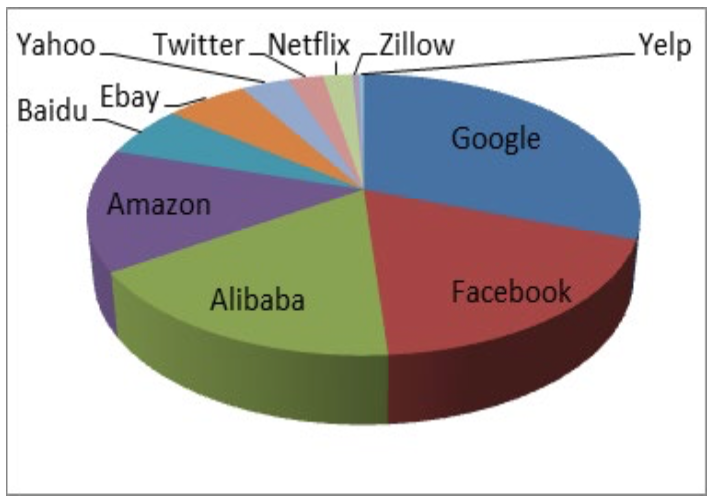 The www.dreamgrow.com site tallies the US market share of the top 10 social networking sites from 2008-2012. Leading the space is Facebook with a 63% market share, followed by Google's YouTube with 20.1% and Twitter a distant third with 1.8%. Reviewing the Top 10 chart on the dreamgrow website we found that Twitter, Google+, LinkedIn and Pinterest (an online picture posting board) have been among the fastest growers this year. Investing in Growth Stocks You Can Believe In! In September 2011 we wrote a piece called Total Return through Dividend Growth Stocks in which we discussed how to benefit from a core portfolio of income plus dividend growth stocks. In this letter we focus on adding growth to portfolios by investing in sustainable growth stocks. We find original growth ideas by looking for an excellent product or service that is growing rapidly. We hope to spot a trend that is not a "flash in the pan" but one that may last for many years into the future. Some examples of these trends may be right in front of you. Perhaps you are reading this report on an Apple iPad. Maybe, like Alec Baldwin, you play Words with Friends while travelling. Or you may wonder who makes a new food product you like. From everyday life, and by studying stocks and the business world, we can find products or services that may be good investments at the right time. By investing in excellent products that you use around your home or office, you can save resources and possibly find a good investment in the process. When we researched the water industry, we found that a PUR water filter could improve water quality while eliminating plastic bottles, and so we installed a water filter. In our last letter on LED lighting, our research resulted in the installation of energy-saving Cree and Phillips LED bulbs and fixtures around the house and office. We have also examined and invested in various renewable utilities in order to earn back the cost of our electric, water and telephone bills (and hopefully more). When I was a kid, my dad used to walk around the house turning off lights that were not in use. That was my first lesson in energy efficiency and today I walk around turning off lights. Energy efficiency does not bring thrills to the household (more like chills), but it does save money on power bills. By making wise choices, you can improve the quality of light (and life) in your home, saving resources in the process. In addition, this path leads to some companies that may be good investments at the right time. 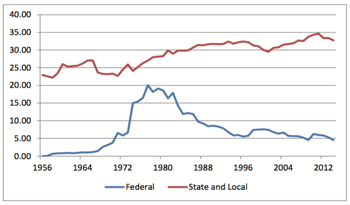 The United States economy has become more energy efficient as a result of higher oil prices both in the 1970s and in the past decade. The US has increased its industrial production at a faster rate than its energy consumption over the last 40 years. In addition, new technologies are driving electric efficiency to the next level with use of hybrid and plug-in electric vehicles, efficient lighting, and efficient appliances. New car regulations have boosted efficiency to 33.8 miles per gallon in 2010 from 28.5 miles per gallon in 2000. In addition, the nation’s electricity grid is getting smarter as products such as Itron’s smart meters and Johnson Controls’ smart thermostats help to save electricity. The book Green Investing says that American utilities could reduce peak energy demand by as much as 7% and save $15 billion a year by deploying “demand response” energy systems enabled by utilities through smart meter readers and sensors in homes and businesses. In this time of historically low fixed income and money market yields as well as volatile equity markets, we think it makes sense to invest in dividend stocks for increased income and related safety of principal. This is why we continue to invest a substantial portion of our portfolios in dividend securities with 8 out of 10 of our largest holdings currently being dividend stocks. Dividends are one component of the "total return" investment strategy with the other component being the potential capital gains return from the stock. We always look to growth stocks as the key way to increase investment returns, but view the total return strategy as a good base strategy for many portfolios. As an example of total return, one of our holdings, Kraft Foods, currently pays a dividend of $1.16 per share annually on a stock price of $33.71 per share resulting in an annual "dividend yield" of 3.4%. But Kraft is also projected to grow its earnings by 11% next year from $2.27 per share to $2.52 per share (this example ignores the company's split). Assuming that the stock maintains the same P/E ratio on its next year's earnings estimate, Kraft common stock might also be expected to appreciate by 11%. If you add that annual 11% capital gain to Kraft's 3.4% dividend yield, you get an "expected" annual total return of 14.4%. Not bad. Of course, there is the risk that Kraft's earnings could fall, or its P/E ratio could shrink, meaning its stock might go down instead of up next year. But even in that event, Kraft is likely to pay the 3.4% dividend which helps investor safety. If we can solve the world’s energy problems, we will have taken a giant leap towards world peace and prosperity. The Japanese earthquake, tsunami and subsequent meltdown and radiation disaster at the Fukushima plant has caused a major re-evaluation of electric power generation worldwide. Specifically, countries such as Germany, China, India, the United States, and Japan itself, are reconsidering how much nuclear power they should use, if any, for their electric power generation needs. Germany has closed seven nuclear power plants and has put its remaining nuclear power plants on hold. Switzerland plans to phase out all its nuclear power by 2034. The immediate effect of this is an electricity "power vacuum" since at least 11 gigawatts of nuclear energy have been shut down in Japan and Germany with more to come. We undertook this study in order to find companies with women’s leadership that can give us excellent investment returns. This work is an offshoot of our March 2008 Growth Letter, The New Nifty 50: The Best Places to Work Worldwide. It turns out that in the Fortune 1000, there are only 27 women CEOs or 2.7%. It seems likely that these few women who have made it to the top are the cream of the crop. Thus, our intuition is that many of these women leaders are superior managers, leading to potentially better financial performance at their companies. A number of sources quoted in the paper Gender Equality as an Investment Concept by Joseph F. Keefe, CEO of Pax World Funds support this idea. In addition, these sources and others indicate that women managers are better team builders and take lower risks in developing the franchise value of their businesses. This may lead to lower volatility in women-managed businesses, leading to lower volatility in their stock prices. For example, Nicholas Kristof of The New York Times, while visiting the global Davos conference, asked attendees "whether we would be in the same mess today if Lehman Brothers had been Lehman Sisters. The consensus is that the optimal bank would have been Lehman Brothers and Sisters." The $18.8 billion dental industry is poised for increased growth as the aging US population focuses on maintaining their teeth and as we exit the recession. Dental technology continues to progress with noteworthy advances being 1) the replacement of mercury amalgam with tooth-color fillings, 2) technology to replace crowns in a single dental visit, 3) advanced orthodontic technology such as Align Technology’s Invisalign, and 4) better toothpaste, floss and toothbrushes, among other things. 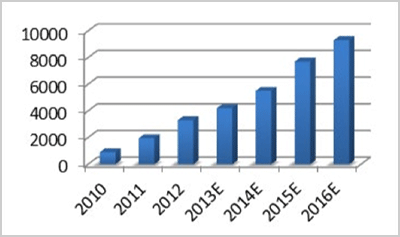 Why invest in the dental industry now? The dental industry is considered to be a defensive place to invest as many of the dental companies have strong earnings and cash flow and good balance sheets. At the same time the dental industry has not been completely immune from the recession. As a number of these stocks have fallen off in price, this gives us a potential opportunity to buy them at a good value. In addition, we view the dental industry as providing generally positive products and services for people. The dental industry is made up of several different categories. First there are personal consumables which includes toothpaste, toothbrushes, mouthwash and dental floss among other things. Then there are professional products used by dentists on an everyday basis including prophy’s (see the photo), impression trays, cements, and other products. Finally there is dental capital equipment such as X-ray machines, drills and dental lasers. The Return of the Electric Car – This Time for Good! 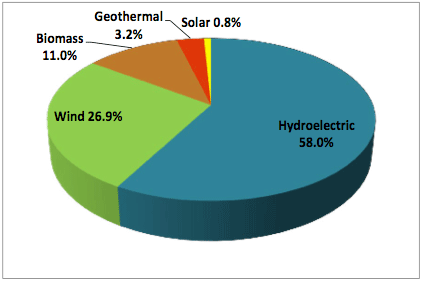 Our quarterly Growth Letter of June 2008 Solar Outshines Oil – From Solar Rooftops to Electric Cars conveyed the world’s "post-petroleum" message that energy distribution and transportation will shift from hydrocarbon-based to alternative energy/electricity-based. In the next 20 to 50 years we envision a world where solar and wind power will become the dominant electricity generation sources needed to propel electric cars, trains and buses, with a "leave no trace" zero pollution and carbon footprint. The electric car and its related ecosystem of components, such as batteries and electric motors, is poised for rapid growth over the next several years. As batteries improve and charging stations become plentiful at work, at home, and on the road, electric and plug in hybrid cars are expected to replace gasoline vehicles. Tesla Motors went public in late June, raising $238 million, and its $109,000 Tesla Roadster is the only electric car in production now cruising US highways. Tesla announced the Roadster 2.5 last month, and with 1200 Roadsters sold, Tesla is in final design for its 2012 S sedan. One of the best sources of new investment ideas are companies that are "going public." This means that they are offering shares on the public markets for the first time—hence the term "initial public offering" or IPO. IPOs are often the result of a venture capital backed company that is hopefully prepared for life as a public company. New public companies may also form as a spin-off of a larger company or the re-emergence of a private company that was formerly public. In addition, existing public companies may raise supplemental capital through a "secondary offering." Public companies these days need to be larger than in prior times, due to the passage of the Sarbanes-Oxley Act of 2002, which resulted in much higher than previous annual auditing expenses for public companies. This among other factors has resulted in many fewer small companies going public. This could be one reason why the leading underwriter of small to mid-size technology firms, Thomas Weisel Partners, recently decided to sell its firm to Stifel Financial. Investing in Natural and Organic "Slow Food"
The movie Food, Inc., featuring Fast Food Nation writer Eric Schlosser and food guru Michael Pollan, and the book Righteous Porkchop by Nicolette Niman, are both highly critical of "factory farming." Factory farming involves feeding animals mostly corn and soybeans in warehouses using more antibiotics than for animals in traditional free-range farming. In addition, livestock's concentrated waste often ends up in lagoons, which can pollute surrounding groundwater, fields and streams. The Food, Inc. film suggests that organic chicken, pork or beef that has been fed a vegetarian diet with low or no antibiotic use along with open air livestock management is better for you. Organic farms also spread manure over a manageable area so that it can fertilize the next year's grass and hay. Read the entire March 2012 issue of the Girton Capital Growth Letter: Investing in Growth Stocks You Can Believe In.